I have a blog called Pegasus Librarian which chronicles my musings about libraries, education, technology, and anything else I feel like publishing for the world to see. I also wrote an article for a zine, so if you want to see what a course devoted to stapler curation would look like if it were offered in library school, just ask. The zine is called Codslap! and was produced by Steve Lawson for the Library Society of the World. I have a cat named Pippin and a parakeet named Gypsy. Jastram, Iris, Danya Leebaw, and Heather Tompkins. “CSI(L) Carleton: Forensic Librarians and Reflective Practices.” In the Library with the Lead Pipe, 2011. Jastram, Iris, and Ann Zawistoski. “Personalizing the Library via Research Consultations.” In The Desk and Beyond: Next Generation Reference Services, edited by Sara Steiner and Leslie Madden, 14–24. Chicago: Association of College and Research Libraries, 2008. Smith, Kevin, William Cross, Laurie Kumerow, and Iris Jastram. Developing Copyright Policy: A Guide for Liberal Arts Colleges, 2010. Zhang, Jin, and Iris Jastram. “A Study of Metadata Element Co-Occurrence.” Online Information Review 30, no. 4 (2006): 428–453. doi:10.1108/14684520610686319. ———. “A Study of the Metadata Creation Behavior of Different User Groups on the Internet.” Information Processing and Management 42, no. 4 (2006): 1099–1122. Jastram, Iris. “Alice in Libraryland.” Future Ready 365, 2011. ———. “Locations of Literacy: Information Literacy (plenary Panel at MnWE 2014).” Pegasus Librarian, 2014. ———. “Some 100-Level Information Literacy Concepts in Lesson Plan Form.” Pegasus Librarian, 2011. ———. “The Age of Big Access.” ACRLog, 2010. ———. “USE-MAN! Copyright Basics for Academic Contexts.” Pegasus Librarian, 2013. Gould Library Reference & Instruction Department. Information Literacy at Carleton: Six Critical Habits of Mind. Northfield, MN: Carleton College. 2008. ———. The Liberal Arts and Information Literacy: Thinking Critically about Research Practices. Northfield, MN: Carleton College, 2007. Calhoun, Sarah, Iris Jastram, Nikki Melville, Annette Nierobisz, Emily Oliver, and Kristin Partlo. "Public-Facing Student Scholarship in Your Classroom." LTC Presentation. November 6th, 2018. Calhoun, Sarah, Melissa Eblen-Zayas, Iris Jastram, Kristin Partlo, Janet Russell, and Celeste Sharpe. "Perspectives on Connecting SoTL: How to use our distributed past to create a collaborative future." Poster presented at ISSOTL 2018, Bergen. October 26, 2018. Jastram, Iris, and Jason Spartz. "Collaborations Across Teams." Presented for MN-IT, St. Olaf. July 31st, 2018. Jastram, Iris, and Celeste Sharpe. "Public-Facing Student Scholarship in Your Classroom." Presented for the Future of Publishing series. February 1st, 2018. Jastram, Iris, and Kristin Partlo. 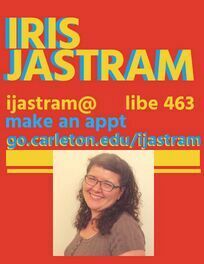 "Information Literacy at Carleton." Presented at the New Faculty Winter Workshop. November 29th, 2017. Jastram, Iris, Danya Leebaw, Claudia Peterson, and Thabiti Willis. "Sharing Our Search History: Revealing shared curricular goals within disciplinary assessments." LTC Presentation. October 31st, 2017. Calhoun, Sarah, Adrienne Falcon, Iris Jastram, Annette Nierobisz, Kristin Partlo, Mary Savian, and Ann Zawistoski. "Truth, Information Literacy, and the American Way Assignments that make sense of current event." LTC Presentation. May 9th, 2017. Jastram, Iris and Danya Leebaw. "Framing Up Information Literacy in Student Writing." Presented for the ARLD Day Pre-Conference Workshop. April 27th, 2017. Jastram, Iris. ": Disciplinary citation styles, discourse, and why students care." Presented for the ARLD Day Pre-Conference. April 27th, 2017. Jastram, Iris, Austin Mason, and Sarah Calhoun. “Building a Distributed Collaborative Model for Digital Scholarship Support at Liberal Arts Institutions: A Mixed Metaphor Salad.” At the Oberlin Digital Scholarship Conference, June 12th, 2016. Jastram, Iris, Kristin Partlo, and Sarah Calhoun. “Learning from Success: Approaching Data Management in the Humanities with Optimism and Good Cheer.” At the Oberlin Digital Scholarship Conference, June 11th, 2016. Jastram, Iris, and Austin Mason coordinated and ran the “Day of DH.” Sponsored by the Library and the Humanities Center. May 2nd, 2016. Presentation based on a document (PDF) authored by the Reference & Instruction librarians at Gould Library. "The Catalog of the Future." Presented at the MN-IUG Spring Meeting 2006 keynote address (June 1, 2006, St Olaf College).